Perhaps you’re lucky enough to have been invited to an Italian wedding. Maybe you’re even luckier, and you’re hoping to get married in Italy! Either way, our guide to quintessential weddings in Italy covers everything from ‘lo voglio’ (I do) to what’s on the menu. Italian weddings are loud and luxurious. You should expect an emphasis on religious ceremony, family and tradition. 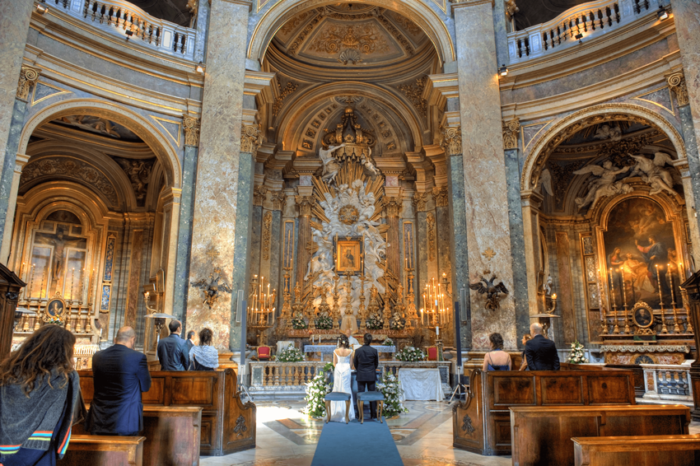 As a predominantly Catholic country, most ceremonies take place in a church – the bigger and more opulent, the better! Instead of bridesmaids and best men the couple select witnesses, or testimoni. Like other Western weddings, the bride’s father escorts her down the aisle, and upon exit guests throw rice onto the couple’s heads – an ancient symbol of fertility. With centuries of history to draw from, many weddings in Italy involve some peculiar traditions, which vary from region to region. Sometimes the bride cannot wear gold, thought to bring bad luck. Often a small piece of iron is sometimes carried by the groom for good luck. Sometimes couples walk up to the altar together, or the groom is in provides the bouquet, which he presents to the bride. Another endearing custom is to tie a huge ribbon across the entrance of the church, which may be the origins of the phrase ‘tying the knot’! 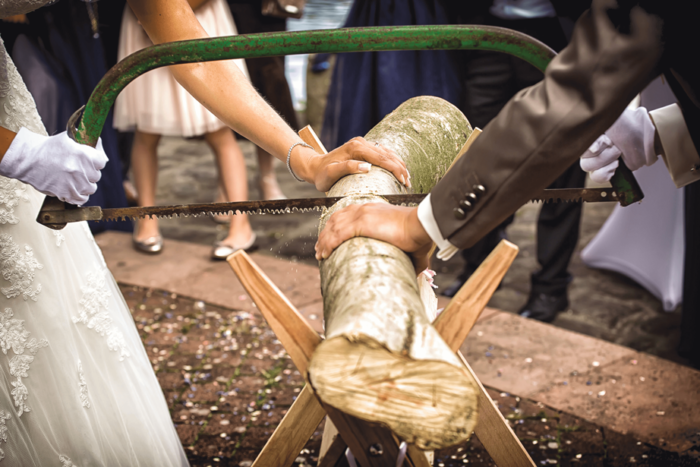 Bizarrely, in some regions, the bride and groom use a double-handled saw to cut a log in two, symbolising their partnership. Italian wedding receptions, like others, take place in various venues. The difference is, Italy has a wealth of stunning villas, palaces, and castles to choose from. A reception in an Italian villa? What bride doesn’t go weak at the knees at the idea?! Picturesque gardens, breathtaking architecture, lavish dining halls! What’s more, a villa represents a portion of Italy’s epic history, which the Italians (rightly so) are very proud of. Our Top Venue Pick: Villa Tasca is the archetypal Italian villa, nestled in eight hectares of ancient citrus orchards between Palermo and Monreale. Frescoed and tiled interiors all come with a view of Sicily’s most emblematic Victorian-style gardens. While most Italian brides opt for a white dress, brides in Tuscany sometimes wear a black dress and white hat instead. 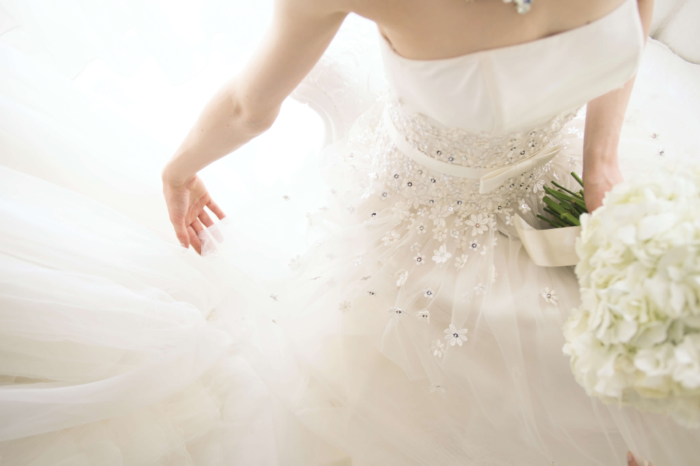 Brides often have two dresses: one for the ceremony and another for the celebration. In Venice, the bride saves the best dress for the party! The traditional veil, which is said to be as long as the love shared between the couple, dates back to Roman wedding customs. 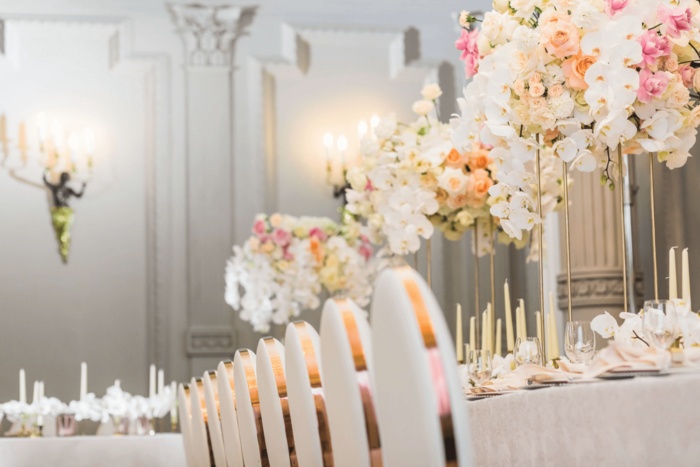 Weddings in Italy, especially the reception, follow the general theme of luxury and opulence, but are also very humorous affairs. During the meal, guests will periodically start to clang their cutlery against their glasses as encouragement for the couple to kiss. In some northern regions, the groom’s witness used to cut the groom’s tie into pieces and sell them to guests! While the newly-weds visit each table, friends and family take the opportunity to sneak away and prank the couple! Some even sneak into the couple’s new house – think fish in the bathtub, or hiding beloved clothing items! The term ‘honeymoon’ originates from the ancient Romans. Newly-weds ate honey and hydromel for one full moon cycle to ensure good luck and fertility. At weddings in Italy, guests move on to the reception venue before the newly-weds to enjoy aperitivo rinforzato (drinks and appetizers) while the couple poses for their photos. These are normally treats like mozzarella bites, or frittini (lightly fried finger food). 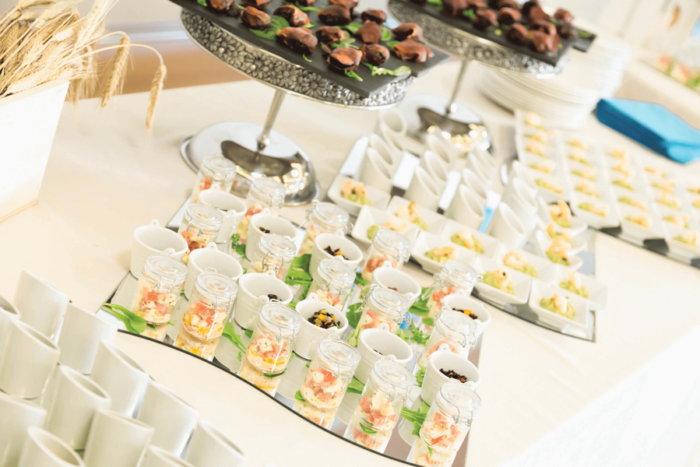 The food – and of course the bride – are the highlights of any wedding, so come hungry! Dinner can either be served as a buffet or by a waiter, and will more than likely start with the primo piatto (first dish), which will be pasta or rice based. Then the main, or secondo piatto, which will likely be meat or fish with a selection of sides. Desserts vary, there’ll be an array of them just before the cutting of the cake – which is white for purity. Undoubtedly, you’ll find five beautifully wrapped bomboniere (pink and white candy-coated almonds) at your seat. These represent blessings of health, happiness, fertility, wealth and a long life. No Italian wedding reception would not be complete without a welcome drink! See our list of the most iconic Italian cocktails for more!